Maine Audubon is a beloved part of Maine’s nature-based culture, with chapters, centers, and sanctuaries all over the state. We’re fans of the great Maine outdoors and were delighted to have the opportunity to work with a beloved nonprofit organization focused on experiencing and preserving Maine’s wildlife and habitat as they embarked on a new online habitat for themselves. Maine Audubon came to us with a solid vision and provided us with an excellent sitemap. They’d clearly put time into thinking about how to present their content and the goals they had for their visitors. 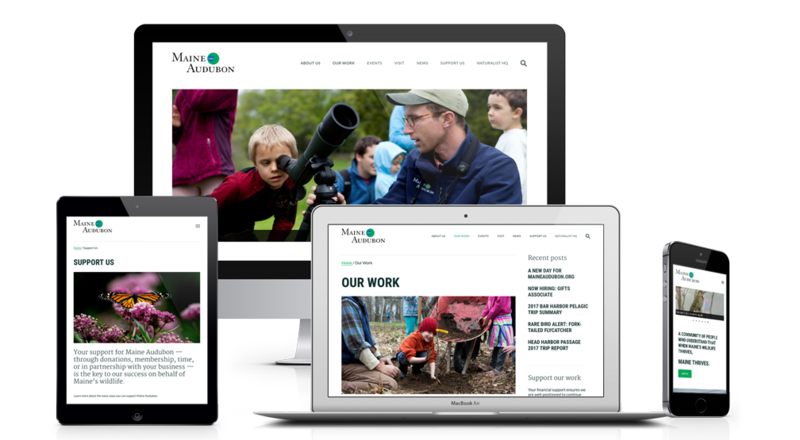 The Maine Audubon website redesign focused on ways to help deliver a wide array of content to audiences — from bird watchers to citizen scientists to naturalists of all ages and everyone in between — visiting on myriad devices. News and updates, online donations, a feed of gorgeous Instagram images, and access to event registration tools are among the site’s features. Robust pages for Audubon centers and sanctuaries include a consistent presentation for general information, directions, history, media presentations, and trail map links. Of course, the site also gives Maine Audubon the opportunity to share its gorgeous images, inspiring conservation, environmental education, and advocacy for Maine’s wild places and creatures. We feel fortunate to have worked with Maine Audubon on creating a great online environment for nature enthusiasts and supporters that will last them for years to come. You can visit the Maine Audubon website at https://www.maineaudubon.org.